Craig Cramer is professor of organ at the University of Notre Dame. One of the most traveled concert organists of his generation, he maintains an active recital career across the country. He has performed in forty-four of the United States, and in Canada. Regularly invited to perform on some of the most important historic organs in the world, his annual European concert tours have included performances in nearly every country in Western Europe. He holds degrees from Westminster Choir College and the Eastman School of Music, where he earned a Doctor of Musical Arts in organ and was awarded the prestigious Performer’s Certificate. He has studied with Russell Saunders, William Hays, James Drake, David Boe, and André Marchal. In 1994–1995, Dr. Cramer performed the complete organ works of Bach in a series of eighteen concerts, using a distinguished set of mechanical-action organs in Indiana. 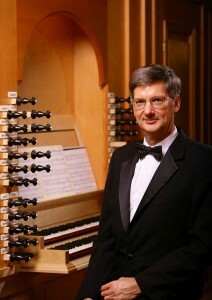 In honor of the 300th anniversary of the death of Dieterich Buxtehude, in 2007, Cramer performed the composer’s complete organ works in a series of nine concerts at Notre Dame; he was invited to repeat the series at the Cathedral of St. Joseph in Columbus, Ohio, in 2011–2012. Widely recognized as a pedagogue, he received a Kaneb Teaching Award, for distinguished faculty, from the University of Notre Dame. His performances are frequently heard on American Public Media’s Pipedreams. He has fifteen recordings to his credit on the Arkay, Dominant, Dulcian, Motette-Ursina, Organeum, Naxos, and JAV labels. He is represented by Penny Lorenz Artist Management.